Our EU Ecolabel accredited washroom cleaner is ideal for daily cleaning of all washroom surfaces. It removes general soiling to leave all surfaces sparkling clean without any streaking and freshly fragranced. Empty refill bottle for diluting Delphis Eco Washroom Cleaner concentrate (W24345). Our EU Ecolabel accredited multi-purpose cleaner is an all-in-one cleaner specially developed to be tough on grease, dirt and stubborn soiling. It works brilliantly on all hard surfaces to leave them clean and shiny and is also a safe and effective cleaner for wool and stain resistant nylon carpets, rugs, etc. Empty refill bottle for diluting Delphis Eco Multi-Purpose Cleaner concentrate (W24343). Pelican pump for 5 litre Delphis Eco products. 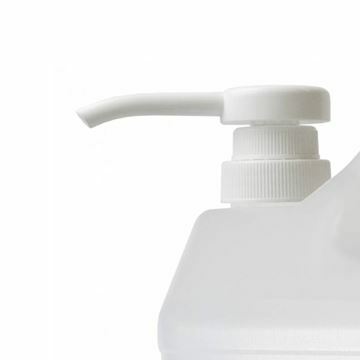 Our anti-microbial and alcohol free Hand Sanitising Foam has been specially formulated to provide safe, accessible hygiene where infection through cross contamination is a problem. It can be used to sanitise hands prior to or following contact with patients, surfaces, animals, food, children etc. It cleans and kills germs to prevent infection, without the need for drying on a towel. Our EU Ecolabel accredited toilet cleaner is designed for a daily cleaning regime to kill germs and deodorise where bacteria breed. It easily removes limescale, rust and stains from toilets and urinals. Our Destainer and Renovator removes beverage stains from kitchenware. It effectively removes staining caused by tannins and bacteria on drinking glasses and coffee cups, and marks caused by machine detergent, yeast and protein residue. Empty refill bottle for diluting Delphis Eco Anti-Bacterial Sanitiser concentrate (W24344).